Summary: This hot tub is a convenient and well-built addition to any backyard. It is perfect for relaxing in after work or with your partner. It is also safe for children to use. The combination of price and quality make theSaluSpa Siena AirJet Inflatable Hot Tub a great value! Whether you are looking for hot tub for the lawn or as a beautiful addition to your deck, this hot tub is the ideal choice. The size of this hot tub make it easy to fit just about anywhere while still maintaining comfort and strength. 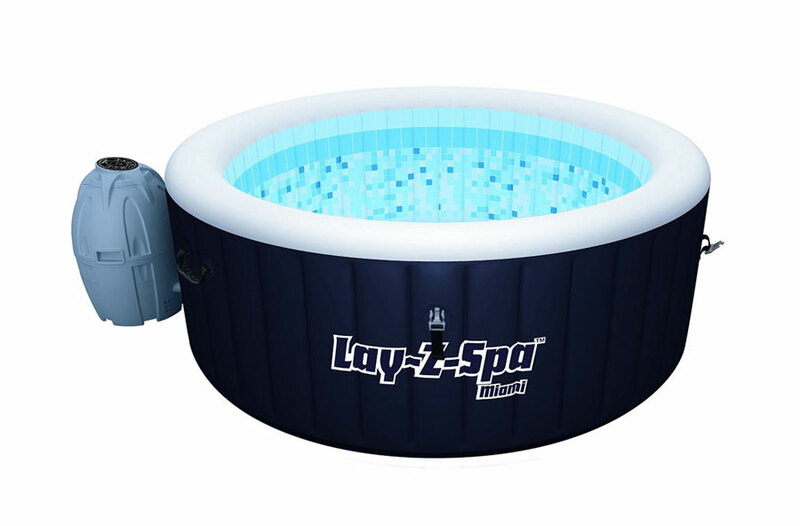 This portable hot tub boasts a wide variety of features. Everyone will find something that they love about the SaluSpa Siena AirJet Inflatable Hot Tub. The hot tub is easy to set up no matter if you are putting it inside or outside. You do not need any tools to begin set up. As soon as the box arrives you can begin to set up your luxurious new spa. You can use the step by step instructional DVD included to easily begin the setup. The included pump will inflate the spa and then you can fill it using a simple garden hose. It will take some time to heat up the spa once it is filled, so plan on using it for the first time the next day. Heating it overnight will allow the spa to reach its optimal temperature and provide you with maximum relaxation. 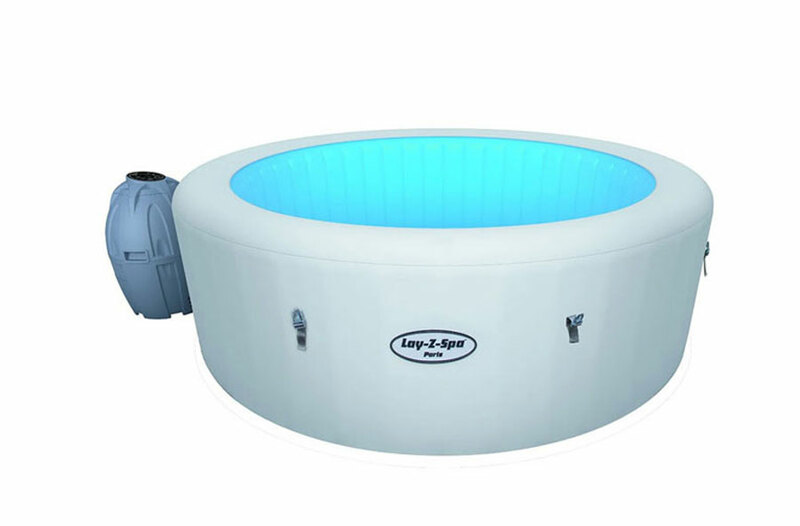 Whether you are sore from a tough workout at the gym or simply need to relax after a long day at work, this hot tub will provide you with the comfort that you need. The water can reach a temperature of 104 degrees Fahrenheit and provides comfort through the massage jets. There are 120 jets surrounding the spa that provide you with a warming massage. No matter where you sit in this spa, you will be comforted by the jets. The dimensions of this spa allows most people to feel completely surrounded by warmth. Since this spa is a rectangle shape, it allows even those with longer legs to stretch out and relax without feeling cramped. 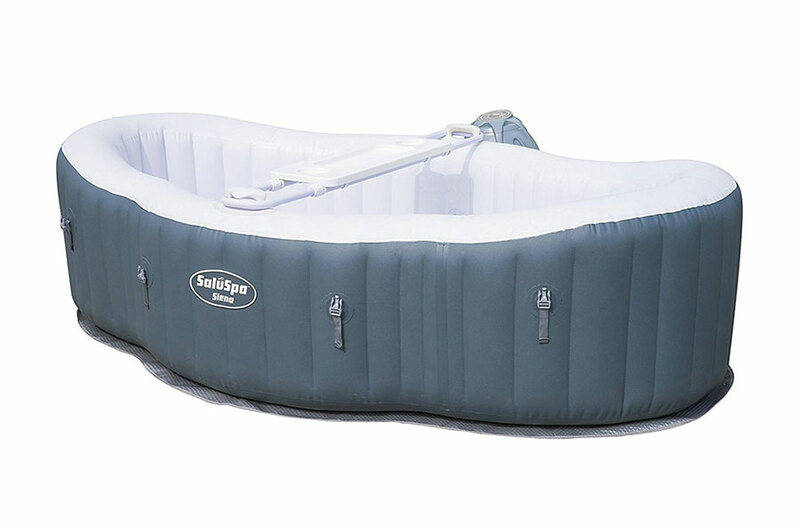 The SaluSpa Siena AirJet Inflatable Hot Tub has a unique seating configuration, making it comfortable for you and a partner or even children. There is also a beverage table included. This allows you to take your favorite drink into the spa without worry of spills. The tub is extremely durable. The walls are made of Tritech material so you can feel comfortable leaving the hot tub out in the elements and not worry about the walls becoming damaged. 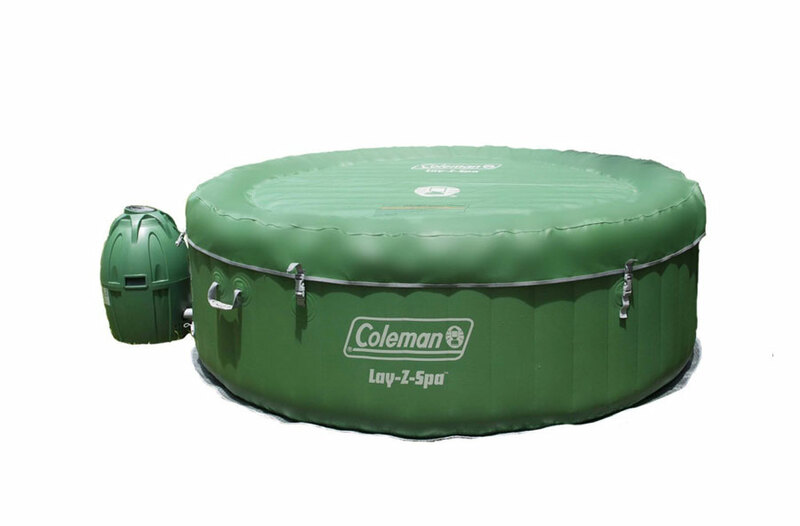 The spa also comes with an insulated inflatable top that clips onto the tub for added protection. This top will keep debris out and keep the warmth in, while the clips keep the top secured to the hit tub. The spa has two handles on each side that make it a breeze to safely exit. You can simply grab and pull and the durable material allows you to easily exit (if you ever want to). The spa has an automatic timer so you can start and stop the spa at times that are convenient for you. When it comes time to clean and maintain the spa, the ease of use continues. Included in the package is a DVD maintenance guide, a filter cartridge, pressure gauge, and chemical floater. These included tools make it easy to clean the spa as well as monitor it to make sure all chemical levels are safe and the pressure is at the correct level. The maintenance of the spa in general is very easy. There are two filter cartridges that are easy to replace. Within a few minutes you can be assured that your spa will have refreshing, clean water. You will need to purchase the chemicals for the spa, but that is a small investment when this hot tub is such a great value. 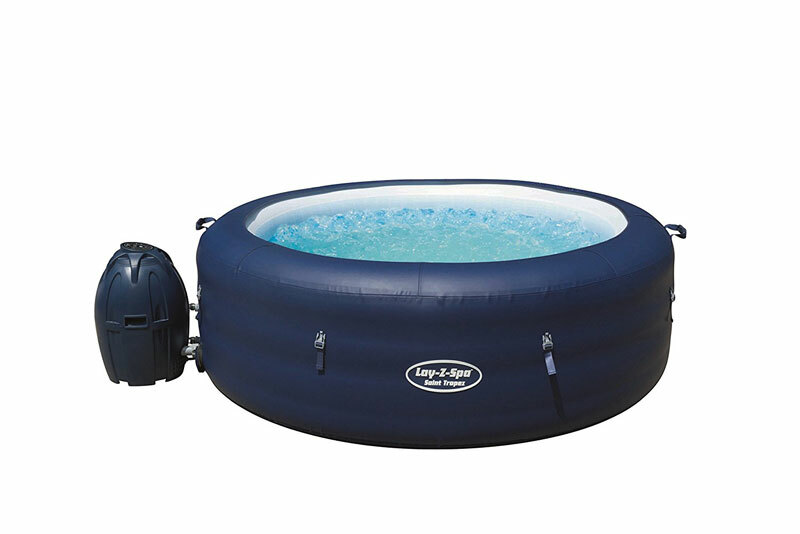 Everything that you need to get started is included in the box with the SaluSpa Siena AirJet Inflatable Hot Tub. All that you need to do is add some water and yourself! People: 2 adults, or children. Inflated Size:98.2 x 26 x 58.7 inches. There will be an investment with this spa, since you will need to provide the electricity to heat the spa. This is a cost included with any hot tub since the pump needs to run to heat and maintain the water. The insulated cover that is included with this tub help to keep the costs low by keeping the warmth in the tub. In order to keep you hot tub functioning smoothly, always keep an eye on the condition of the water. Make sure you remove any debris that get in so that the filter does not have to work hard to get them out. This will help to extend the life of the filter. Change the water according to the instructions, or whenever the water begins to look cloudy or dirty. Ease of set up. The included DVD is very helpful in getting the spa set up quickly. This spa is a great value. For a small investment you get a comfortable, durable, and inviting spa that looks great in any home. It is well built and feels sturdy when in use. Everything you need to assemble is included, which adds to the value. If you are a couple or even if you have small children this tub is the perfect size. 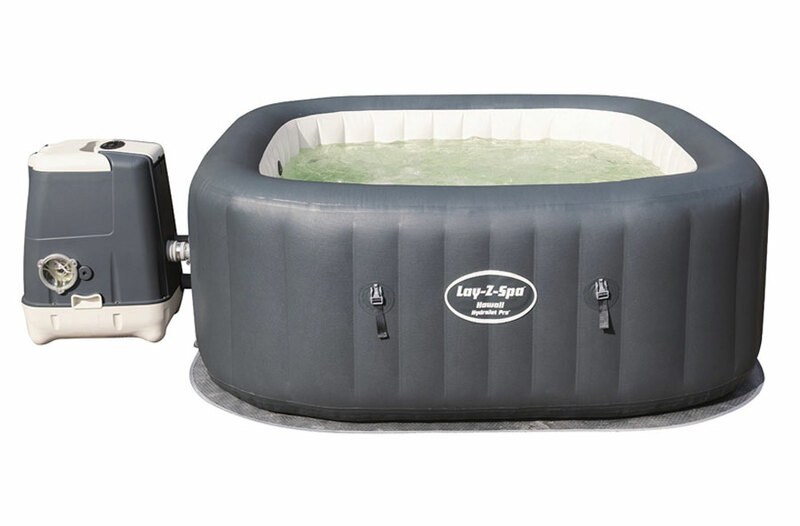 At this price point, you are not going to find a better hot tub than the SaluSpa Siena AirJet Inflatable Hot Tub.